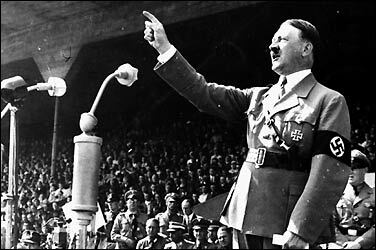 The Moving Picture Blog: Hitler speaks! From the Telegraph, yet another item I wouldn't dare make up: "New computer software that can read lips at almost any angle has helped make sense of one of the Second World War's lingering mysteries —Hitler's home movies." No, really -- I didn't make this up. "The technology allows the dialogue to be dubbed on to the silent films, many of them made by Eva Braun at Hitler's mountain retreat, the Berghof. With the new soundtrack, Hitler can be heard encouraging young children towards a life in the military, criticising even his closest henchmen and flirting with Braun... The film shows very different Hitler from the strident orator who led Germany into war. At ease among his guests, he cracks jokes and talks animatedly about his love for cinema — his tastes included Mickey Mouse. "He is also seen teasing Braun about a screening in his cinema at the Berghof. 'I understand you didn't like the movie last night," he says. "I know what you want. You want Gone with the Wind.'" But I want to know: Who's the actor who dubbed Der Fuhrer? And could the dubbed home movies be any more unsettling than a German-produced comedy about Hitler?